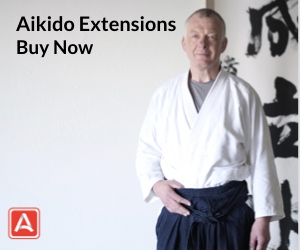 Aikido has grown explosively since World War II. 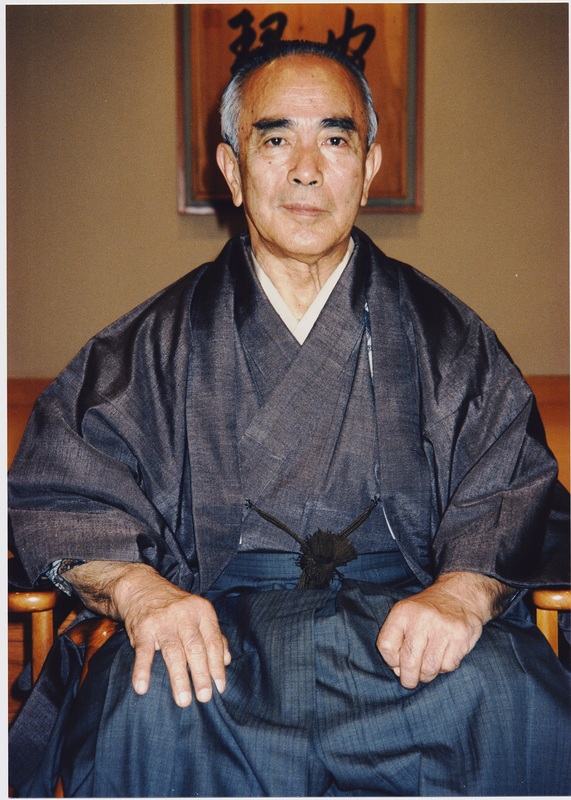 Koichi Tohei, a distinguished contributor to this development, is perhaps one of those most qualified to talk about the history of aikido. Most of the active aikido shihan (even those 7th dan and above) in the world today were taught, at one time or another, by Tohei. Feeling strongly that future generations will decide their own destiny, Tohei has chosen to speak out very little over the years. 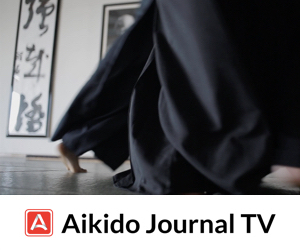 At long last, on the condition that we represent his organization’s activities and thinking as they are, Tohei Sensei has finally agreed to this exclusive interview with Aikido Journal. Sensei, tell us about your approach to aikido. The only sure way to be absolutely correct is to avoid being caught in the whirlwind of these so-called facts of the relativistic world and instead be in accord with the absolute principles of Heaven and Earth. When it comes to standards of judgment, that which is in accord with the principles of Heaven and Earth is correct, while that which is not is not correct. Decisive action is born of an understanding of that which is in accord with the principles of Heaven and Earth. A lack of this understanding leads to “unreasonable effort,” or muri, the literal meaning of which is “lack of principle,” and should be avoided. This has always been my way of thinking and the reason I have scrupulously avoided acting in ways that involve unreasonable effort or that go against these principles. 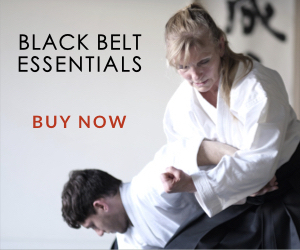 Aikido is essentially a path of being in accord with the ki of Heaven and Earth. Many of those involved in budo, however, tend to talk about things that are illogical and involve unreasonable effort, things that are impossible. But my way of living is to avoid doing anything that is not in accord with principle. What was the most important thing you learned from Morihei Ueshiba? The way people most talk about ki these days tends toward the occultish, but I will say that I have never done anything even remotely involving the occult. Much of what Ueshiba Sensei talked about, on the other hand, did sound like the occult. In any case, I began studying aikido because I saw that Ueshiba Sensei had truly mastered the art of relaxing. It was because he was relaxed, in fact, that he could generate so much power. I became his student with the intention of learning that from him. To be honest, I never really listened to most of the other things he said. Stories about Ueshiba Sensei moving instantaneously or pulling pine trees from the ground and swinging them around are all just tall tales. I’ve always urged aikido people to avoid writing things like that. Unfortunately, many people don’t seem to listen. Instead, they just decrease the size of the tree in the story from some massive thing to one only about ten centimeters in diameter. In reality, it’s pretty difficult to pull even a single burdock root out of the ground, so how in the world is someone going to extract a ten centimeter pine tree, especially while standing on its root system? Such things are nothing but exaggerations of the kind often used in old-fashioned storytelling. 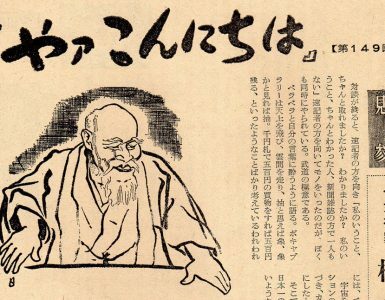 The stories have gotten rather incredible since Ueshiba Sensei passed away, and now people are having him moving instantaneously or reappearing suddenly from a kilometer away and other nonsense. I was with Ueshiba Sensei for a long time and can tell you that he possessed no supernatural powers. Sensei, you seem in very good health for a man about to turn seventy-six. Has this always been the case? Actually, I was rather frail as a child. My father said I needed to be stronger and made me take up judo, which he had been involved in at Keio University. I trained hard and eventually did grow stronger, but after entering the pre-college program at Keio a bout with pleurisy forced me to take a year off. My hard-earned strength suddenly began to vanish again. Unable to endure the thought of losing what I had worked so hard to gain, I replaced the judo with other forms of training such as zazen (seated Zen meditation) and misogi (purification). I vowed not let my strength deteriorate again even if it killed me. Worrying about my health and living as a semi-invalid did nothing to help with my recuperation, so I just said to hell with it, I might as well throw myself into training, even if it kills me. Aikido was part of that training as well. I concentrated on keeping myself strong, and somewhere along the way the x-rays showed that the pleurisy had completely gone away. Amazingly, I had gotten better. Although the ideas were somewhat vague at that time, I had a sense that it was my mind and spirit (kokoro) that had motivated my body. I realized that the way you hold your mind is important. Physical illness is okay (if not desirable), but it is unacceptable to allow illness to extend to your mind or your ki. In Japanese, when the body malfunctions in some way we call it yamai, or byo, which means simply “illness”; but when the failure extends to one’s ki as well we call it byoki. So although my body may be afflicted with some sort of illness, I don’t let that extend to my ki. If the mind is healthy, the body will follow. After my recovery I returned to the judo club, but I couldn’t bring myself to resume training as enthusiastically as before. One reason was that judo inevitably emphasizes conditioning of the body before turning to matters of the mind. My thinking, however, was that the mind moves the body, and that anything you think in your mind you should be able to do with your body as well. Also, having been away from judo for nearly two years, by the time I got my second dan, everybody else was already ranked fourth or fifth dan. Even many of the third dans had progressed so far ahead of me that they could throw me all over the place. That wasn’t very interesting and it wasn’t much fun, either. Hoping to strengthen myself, I went home and started kicking lightly at the support pillars around the house. After doing that a couple of thousand times a day, though, the walls started to come down. My elder sister wasn’t very pleased about that and made me go outside in the garden instead. After a few weeks I got so I could move my feet with the same agility and dexterity as my hands. I went back to the dojo and was able to throw everybody. When did you enter the Ueshiba Dojo? I think it was in 1940. Kisaburo Osawa came in about a week later. I had been thinking what a poor state of affairs it was that I could train on my own for a couple of weeks and come back and throw everyone in the judo dojo. “Why bother with a martial art like that?” I thought. It was then that I met Ueshiba Sensei. Shohei Mori, one of my seniors at the judo club who had worked on the Manchurian Railway, told me about a teacher with phenomenal strength and asked if I’d like to meet him. He gave me a letter of introduction and off I went. Ueshiba Sensei was out when I arrived at the dojo and I was met by an uchideshi named Matsumoto. I asked him what aikido was all about. He replied, “Give me your hand and I’ll show you.” I knew he was going to do some move on me, so I stuck out my left hand instead of my right. Being right handed, I wanted to keep my strongest hand in reserve. He grabbed my wrist and applied a sharp nikyo technique. I hadn’t strengthened that part of my body at all, so it was agonizing. I’m sure my face went pale, but I wasn’t about to let him to get the best of me, so I endured the pain as long as I could. Then I threw a punch at him with my right hand and he got flustered and let go. I was just starting to think that if this was aikido I might as well forget it and go home. Just then Ueshiba Sensei returned. I produced my letter of introduction and he said “Ah yes, from Mr. Mori…” Then as a demonstration, he began tossing one of the larger uchideshi around the dojo. I thought it looked kind of fake until Ueshiba Sensei told me to take off my coat and come at him. I got into a judo stance and moved in to grab him. To my great surprise, he threw me so smoothly and swiftly that I couldn’t even figure out what had happened. I knew right then that this was what I wanted to do. I asked permission to enroll immediately and began going to the dojo every day from the following morning. In the beginning I had no idea what was going on. Even high school students could throw me without any trouble. Finding that rather odd, I tried grabbing even more strongly, but of course then I was only thrown that much more easily. My aikido continued to progress as I continued with my misogi and zazen. After six months or so I was even sent to teach at places like the military police academy in Nakano and the private school (juku) of Shumei Okawa. No one except Sensei could throw me. It took me only half a year to be able to achieve that degree of ability, so I think taking five or ten years is too slow. Even now most people are trying as hard as they can to learn techniques, but I was learning about ki from the beginning. I think it was probably when he was living in Ayabe and heavily involved with the Omoto religion. Ueshiba Sensei often told a story about one day when he was standing by a well wiping himself off after training and he suddenly realized that his body had become perfect and invincible. He understood with remarkable clarity the meaning of the sounds of the birds and insects and everything else around him. Apparently that state lasted only for about five minutes, but I think it was then that he mastered the art of relaxing. Unfortunately, he always talked about that experience using religious-sounding expressions that were more or less incomprehensible to others. Before the war Sensei taught at the Naval Staff College, where he had Prince Takamatsu (a younger brother of the Showa emperor) as one of his students. On one occasion the prince pointed at Ueshiba Sensei and said, “Try to lift up that old man.” Four strong sailors tried their best to lift him but they couldn’t do it. Sensei said of that time, “All the many divine spirits of Heaven and Earth entered my body and I became as immovable as a heavy rock.” Everybody took him literally and believed it. I heard him say that kind of thing hundreds of times. For my part, I have never had divine beings enter my body. I’ve never put much stock in that kind of illogical explanation. You see, I had been out drinking until three o’clock in the morning the previous evening, and Sensei knew what condition I had come home in. He said, “Of course the gods aren’t going to enter into a drunken sot like you! If they did they’d all get tipsy!” That’s why he thought they would be able to lift me. In reality that sort of thing has nothing to do with any gods or spirits. It’s just a matter of having a low center of gravity. I know this and it’s what I teach all my students. It wouldn’t mean anything if only certain special people could do it. Things like that have to be accessible to everyone if they’re to have any meaning. People with so-called “supernatural powers” are usually the only ones who can do whatever it is they claim. Others can’t do what they do and they can’t teach what they do, because what they do is not real; it’s fake. Anybody can do the things I teach. They’re alive in aikido techniques just as they are. All you have to know is how to do them correctly, and viewing them as supernatural powers requiring the presence of some god or what have you is a big mistake. I regard it as my responsibility to teach correctly. Were there any notable personalities in the dojo back in 1940 or 1941, any who would later make a name for themselves? There was no one like that when I first went. There were no students and hardly any uchideshi. What were your strongest impressions of Ueshiba Sensei? He seemed to me like a nice old man. Smiling, you know. In many ways he had a very child-like personality. We have quite a few documents about O-Sensei, but it is still difficult for us to get a picture of him in his day-to-day life. Did he talk about ordinary, everyday subjects? From the recordings we have of him speaking, he seems almost like he came from another planet. Yes, I know what you mean. He certainly did talk that way. I’ve heard that sometimes he would suddenly explode in anger. Yes, that happened often. He was kind to women, though. I never saw him get angry at a woman. Curiously, his anger was never specifically directed at the person he was supposedly angry at. It was like he was just furious by himself, unable or unwilling to direct his anger at its object. Once a young student named Kurita happened to notice that Sensei had shifted in his chair a bit and moved to adjust it for him. Sensei exploded at him, and demanded to know what he was doing. The poor fellow had no idea what was going on until I explained that Sensei had mistaken his action for some kind of mischief. 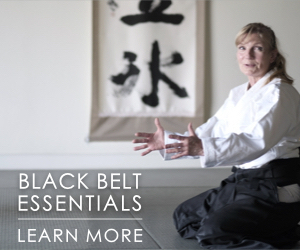 What was O-Sensei’s attitude when you started basing your teaching around the principles of ki? He was jealous and told people not to listen to me. He would say, “Aikido is mine, not Tohei’s. Don’t listen to what Tohei says.” He would peer into the dojo and say things like that, especially when I was teaching a group of women. In that respect he was quite child-like in his directness and lack of sophistication very spontaneous and innocent. People connected with various religions would come to the dojo and get money out of him by flattering him with names like “Morihei Ueshiba, the kami of aikido.” He hardly ever spent money on himself, but he always seemed to be strapped for cash because he kept giving it away to people like that. I was the first one to be officially promoted to tenth dan. Originally eighth dan was the highest rank, but Gozo Shioda of the Yoshinkan started promoting a lot of people. 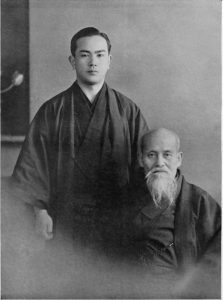 Kisshomaru Ueshiba and Mr. Osawa decided it would help to more firmly establish the Hombu Dojo if we created a ninth dan, which they offered to me. I told them that I thought it unnecessary to create any rankings higher than what we already had, but they insisted that it would help strengthen the Hombu Dojo, so I eventually agreed. We celebrated the new rank in the Ginza entertainment district. Both Gozo Shioda and Kenji Tomiki were there. While I was away in the United States, however, five other people were also promoted to ninth dan, and they tried to keep the fact a secret from me. I figured there was nothing to be done about it such things were bound to happen with a teacher like that and I decided not to worry about it. When I arrived back in Tokyo I was surprised to find Ueshiba Sensei waiting to greet me at the airport – the one and only time he ever did anything like that. When we arrived home he got me to have a few drinks and after a while I was smiling and starting to get jolly. He seemed pleased with that and even got up to do a kind of traditional dancing that amused him. All of this, of course, was because he thought I might be upset that he had promoted five other people to ninth dan after telling me I would be the only one. It put him in good spirits again when he saw that I wasn’t really upset about it. Two or three days later he started asking me to accept tenth dan. I said, “Sensei, please don’t ask me to do that. If you make me a tenth dan I’ll never hear the end of it!” He agreed to my request and so I remained a ninth dan for the time being. About three years later, however, right before the cancer took him, he asked me again. He said to me, “Koichi-chan, please accept the tenth dan.” I felt obliged to agree because it would have been disrespectful to refuse any longer and make him beg me to accept it. It didn’t take long before there were people saying that I wasn’t the only one to have received tenth dan. To avoid the trouble I offered to return the rank, but Mr. Osawa intervened and had the number “1” entered on my certificate to verify that it, and not the others, was official. There was also a big party at the Akasaka Prince Hotel to celebrate the promotion. Until I separated from the Aikikai no one else assumed the rank of tenth dan, but as soon as I left everyone started claiming it. You said that when you started basing your teaching on the principles of ki O-Sensei was jealous and told everyone not to listen to you. On the other hand, he promoted you to tenth dan. What were his intentions in doing so? Was he recognizing you or not? I think he recognized and accepted me. He was well aware that there was no one to equal me then, and he probably felt that if he didn’t promote me he wouldn’t be able to promote the others. But because he had that child-like quality, he couldn’t wait and went ahead and did it anyway. How did Kisshomaru (second Aikido Doshu) view the issue? Kisshomaru originally intended to maintain a certain distance from aikido. He said, “My father and people like Mr. Tohei have come into this world to do aikido. Although I have been born into this family and its attendant roles, I would much prefer a house on a hill from which I can to go to work in the morning and return in the evening.” He had hoped to take a more administrative role as a general director of the organization, rather than be a center of the teachings. When Ueshiba Sensei passed away, Mr. Sunao Sonoda came up with a proposal to make Kisshomaru the general director and me the Second Doshu. However, Ueshiba Sensei had asked me to do what I could for Kisshomaru, so I made every effort to see that he assumed a role that put him as the center of both the teachings and the administration, which is how it eventually worked out. I was privileged to be at Sensei’s side during his last hours. He said to me, “Koichi-chan, is that you? I want to ask you to please do what you can for my son.” I replied that as long as I had anything to do with it he had nothing to worry about. “That’s good… I ask it of you,” he said and closed his eyes. Shortly thereafter he drew his last breath. Mr. Sonoda suggested many times that I should become Doshu, but I was determined to keep my promise. To allow Kisshomaru to assume a stable role I pushed the idea that he should be both Doshu and managing director. He expressed his gratitude for my efforts then, but about a year later, his attitude changed. It was right about that time that he went to the United States and started taking my picture off the dojo walls there. Around what year was that? About three years after Ueshiba Sensei passed away, in 1971 or 1972. Before then nearly every American dojo had displayed photographs of both me and the founder, but Kisshomaru started having mine taken down and replaced with his own. It seems that you enjoyed a good relationship during the time immediately following O-Sensei’s death. Why did that relationship deteriorate later on? In 1971, I proposed that we specifically teach the concept of ki within the Aikikai. 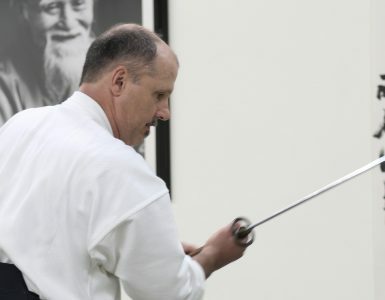 I felt that simply going through the motions of practicing techniques back and forth on a surface level wouldn’t result in aikido, because aikido involves ki. I suggested to Mr. Osawa that we create a class on ki and have people learn that as a basis for their aikido. He rejected the idea on behalf of the Aikikai, saying that the aikido of the Aikikai is the aikido of Kisshomaru, and Kisshomaru’s teachings should therefore form the nucleus of the training. I realized there was no room for me to teach in that environment and asked if it would be okay for me to pursue my suggestion outside of the dojo. That would be fine, they said, so I went out and created a class that focused not on aikido techniques but on teaching about ki. I think that my teaching of ki has contributed much to the growth of aikido. Simple back and forth practice of aikido techniques is okay for students and other young people, but older people with less stamina tend to drop out after a while. My talks on ki were well received by various types of people, including groups of higher level business executivesmanagers and presidents and people like that. However, both Mr. Osawa and Kisshomaru viewed what I was doing as something removed from aikido. In the United States they understood aikido in terms of expressions like “a matter of mind.” In Japan, however, aikido was just called aikido, so I thought it necessary to establish the concept of ki in Japan as well. Mr. Osawa was a very good man and he listened to what I had to say. At that time, however, he was making efforts to support Kisshomaru and tried to prevent people from participating in my training. They refused to let me teach about ki within the Aikikai, but said I was free to do whatever I liked on the outside. With that understanding I started my class at the Olympic Center. It proved very popular and within three months a hundred students had enrolled. Mr. Osawa was surprised when he heard about that and came to me to ask if I would be interested in doing such a class within the Aikikai! I was pretty irritated and said I thought it was a little late for that. None of the people coming to my class on ki knew anything about aikido and they weren’t really interested in pursuing it, since that’s not what they had come to learn. That wouldn’t have happened if I had been able to create a class on ki within the Aikikai to begin with. Given the position he was in, I know Mr. Osawa had to refuse me, but I think he always felt bad about it. When the General Headquarters of the Ki no Kenkyukai (Ki Society) was constructed in Tochigi Prefecture in 1990, Mr. Osawa contacted me privately and also made a small contribution. What kind of people entered the Aikikai following the war? I taught many of the people who are teachers now… Tada, Arikawa, Yamaguchi, Okumura, Yamada, Chiba. Yamada still drops by occasionally. Do you have any memorable training stories from that time? Well, nothing that’s all that interesting. Once when I had a hangover I was training with Tamura, who is in France now. I said, “Look, sometimes I’m going to throw you hard, so be careful.” He must have underestimated my meaning, because when I threw him he went hurtling across the dojo and put his arm through the window glass. He should have just tried to stop himself there, but instead he tried to pull his arm out immediately and ended up injuring himself on the jagged edges. When I saw what he had done I got angry and without thinking yelled at him for not waiting until he could extract himself safely. I immediately regretted it and realized it was cruel to yell at him like that on top of his injury. I made a point of taking him out for a night on the town that evening. Another time I took Tamura and Chiba to a demonstration in Hiratsuka. Because it was during the Occupation, martial arts demonstrations of most kinds were still prohibited. Permission for an aikido demonstration was granted, however, and we demonstrated before the commander of the garrison in that area. Our explanation of the principle of non-competition in aikido was well received and seemed to find sympathy in the audience. During the demonstration I did a technique in which I swept Chiba off his feet with a jo. He adjusted himself on his own to match the movement. But I hate it when people purposely take unnecessary falls like that, so I told him to stop doing unnecessary things and threw him with all my might. He flipped completely upside-down and almost came down right on his head. For a moment I feared that I had done something terrible to him, and I was relieved to see that somehow he had landed safely. There was a student of mine who enrolled at the Aikikai and was praised for his good ukemi and often accompanied Ueshiba Sensei. I used him as my uke once during a demonstration at the Hibiya Kokaido [site of the All-Japan Aikido Demonstration in the early years before the Budokan came to be used], but he started to roll away even before I had done the throw. I said, “What the hell are you doing falling over before I’ve even begun throwing you!? Get out of here!” There were a lot of spectators present, and I think they were all pretty surprised, but it was also an unexpected opportunity for them to realize that aikido techniques are not fake or prearranged. When I was forty-nine years old I made an instructional film on aikido in which people like Masando Sasaki and Seishiro Endo appear as my ukes. 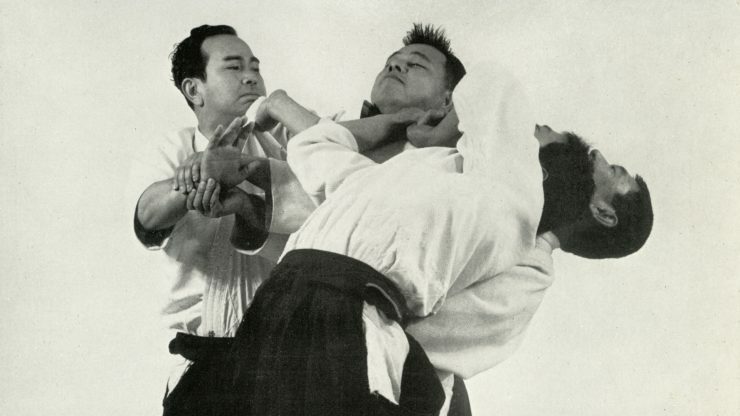 Endo also appeared in a book called Shinshin Toitsu Aikido that is mostly pictures. People like Saotome and Ichihashi, too, I taught them all at one time or another. Do you have any interesting anecdotes from the time after you left the Aikikai? How is Shinshin Toitsu aikido different from that of founder Morihei Ueshiba? When I went to Hawaii and tried to use the techniques I had learned from Ueshiba Sensei, I found that many of them were ineffective. What Sensei said and what he did were two different things. For example, despite the fact that he himself was very relaxed, he told his students to do sharp, powerful techniques. When I got to Hawaii, however, there were guys as strong as Akebono and Konishiki [two well-known Hawaiian sumo wrestlers] all over the place. There’s just no way to use force or power to prevail against that kind of strength. When you’re firmly pinned or controlled, the parts of your body that are pinned directly simply can’t move. All you can do is start a movement from those parts that you can move, and the only way to do that successfully is to relax. Even if your opponent has you with all his strength, you can still send him flying if you’re relaxed when you do your throw. 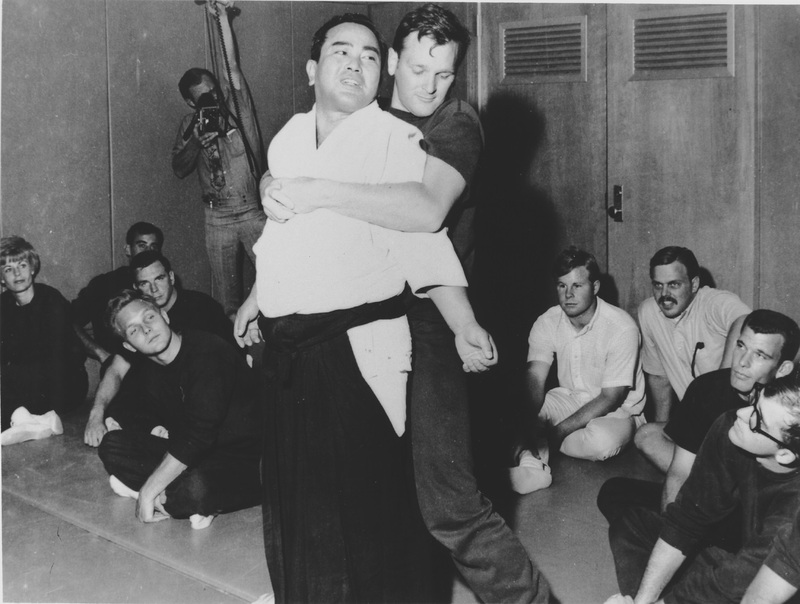 This was something I experienced first-hand during that trip to Hawaii, and when I returned to Japan and had another look at Ueshiba Sensei, I realized that he did indeed apply his techniques from a very relaxed state. While I was with Ueshiba Sensei I was also studying under Tempu Nakamura. It was he who first taught me that “the mind moves the body.” Those words struck me like a bolt of electricity and opened my eyes to the whole realm of aikido. From that point on I began to rework all of my aikido techniques. I threw away techniques that went against logic and selected and re-organized those I felt were usable. Now my aikido consists of about thirty percent Ueshiba Sensei’s techniques and seventy percent my own. You can probably say that Hawaii was where I did much of my most important training (shugyo). The reason I went there in the first place, by the way, was at the invitation if the Nishikai, a group devoted to the Nishi Method of Health. Their intentions, however, had something to do with pitting my martial arts abilities against some pro-wrestler and using the proceeds from the event to build their assembly hall. I didn’t know about that until just before my departure, and by then it was too late to refuse, so I resigned myself to it and went anyway. The Hawaiians were pretty frank in expressing their first impressions of me. They said, “Gee, Sensei, you’re pretty young, aren’t you?” Then they said, “Gee, Sensei, you’re pretty small…” Then they got to the point and said, “Sensei, are you sure you can really do it?” I figured the only thing to do was to show them what I could do and let them see for themselves. After that all the local martial artists and wrestlers became my students. The Hawaii Aikikai was established eight months later, and I was also made an honorary lifetime captain in the local police force. Ueshiba Sensei was never tested like that in his whole life. We would like to ask you about weapons techniques. At the Aikikai Hombu dojo there are some shihan who assert that modern aikido has no weapons techniques. On the other hand, there are teachers like Morihiro Saito who integrate these with the teaching of empty-handed techniques (taijutsu). In your view, are weapons techniques part of aikido or are they not? Saying there are no weapons techniques in aikido is ridiculous. People say that because they don’t know them. Come see what we do with weapons at the Ki Society. It’s also all on our instructional video. That aikido has weapon techniques is just common sense, and it’s a shame that people should say things to the contrary. I wonder, should I go down there and teach them? Tohei Sensei, thank you for taking so much time to talk with us. At 23 he was called into military service and learned under fire the secret of directing ki into the one point in the lower abdomen (seika no itten). 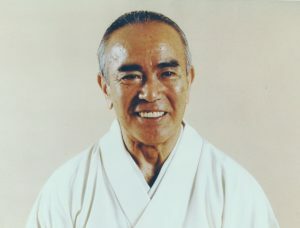 Between 1953 and 1971 he visited the United States on fifteen occasions, teaching and spreading aikido and the principles of ki. 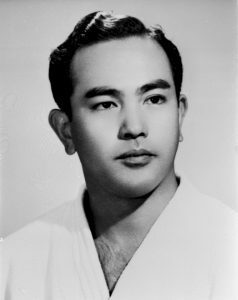 Tohei received tenth dan in aikido in 1969. He served as Director of Shihan (Shihan Bucho) and Director (Riji) of the Aikikai until leaving that organization in 1974. Tohei established the Ki Society (Ki no Kenkyukai) in 1971 (recognized as a non-profit organization in 1977), over which he still presides. The Ki Society is the only organization in Japan specializing in ki training to have been recognized as a non-profit organization by the Ministry of Public Welfare. A timely and enlightening piece. 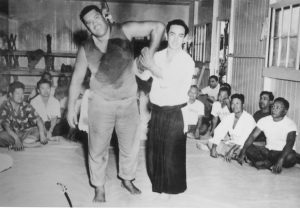 The argument that Tohei Sensei promoted a ‘weak’ aikido is firmly disabused as are the notions some have of ‘mysterious ki techniques.’ I have had the honor of being a student of one of Tohei Sensei’s students Minoru Oshima Sensei. 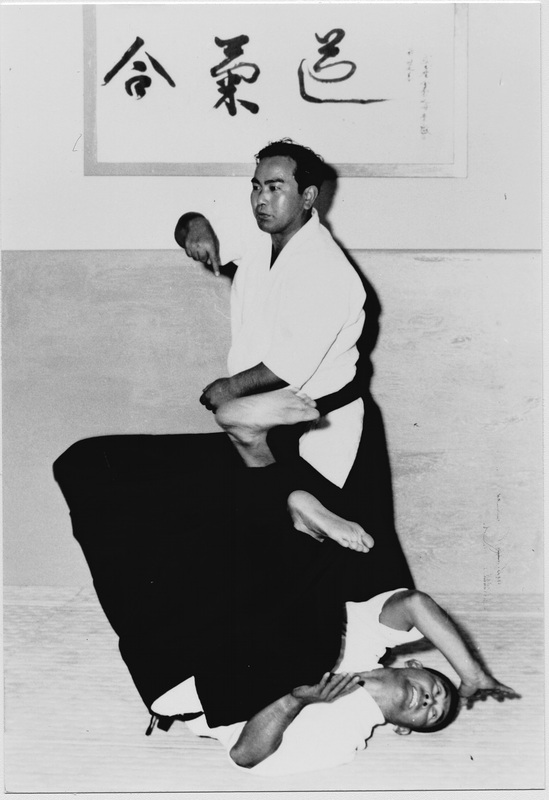 Oshima Sensei demonstrates strength, precision and ki control. I have tried to lift him with 3 others, tried to pull his legs from under him with ropes and countless times been his uke in class where I fell with grace and surprise! The comment by Tohei Sensei that his ki teachings were to have been integrated into Akikikai is significant. Perhaps the time has come for integration of the discovered ways of Aikido. 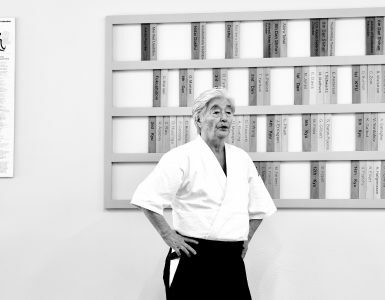 I enjoyed this article on Sensei Koichi Tohei very much, thank you. This is the true and authentic Aikido! Which whilst correct could also be interpreted as waffle. Also, it’s nice to try and not belittle your teacher and show a reasonable level of respect for the person from who you are seeking to gain knowledge. Even though what you like to imagine is your “philosophy” mere words and opinions, may appear to differ somewhat. Otherwise what are you doing there? Spying? I think the respect Mr. Tohei lost was the respect he was failing to give. The universal aiki of cause and effect some call karma at play. We all make mistakes and we can all learn. I agreed with Sagiba-sensei the first time I read his reply many years ago and I still agree. There have been other critics of O-Sensei that have GENTLY debunked some of the myths surrounding him and his teaching style, if for no other reason than they knew it would impact their own dignity and reputation to attack their teacher and leader. Here we have this man who was easily one of O-Sensei’s greatest students! Where is the balance against the great things that he learned from The Man and the conflict that he had with The Man’s Political Organization After The Man Was Retired? If anything, once we have an opportunity to (try to) understand some of O-Sensei’s philosophy–thanks in no small part to this Journal’s late-great founding editor–his eccentricities become somewhat more enlightening (and less objectionable). That leaves me wondering even more what this is about–the development and resistance to “Ki-Aikido” among Hombu dojo faculty? Oh well. If nothing else, I can appreciate the T-bone steak historical insight from a self-admittedly, subjective primary source…if not the greasy hubcap attitude that it was delivered on! Just a note of credit, the two uke in the top photo are Nonaka Sensei and Suzuki Sensei. Thank you for the detail! I’ll note that in the photo description. Great interview that gives much insight into the character of the great late Koichi Tohei.